We didn't know we could do it, until we did it! That's right...this weekend, we designed, constructed and flew our own homemade kites. Kids most definitely need some help and some patience. But the results are spectacular and give you a perfect reason to go outside and run like the wind. What's a better reward than this? This project makes it on my top 3 favorite craft DIY ideas for sure! By the way, on a difficulty scale from 1-10 it is "officially" a 7.33. (This number is comprised of 3 votes: mine (3 difficulty level) a 7 year old (9.5 difficulty level) and a 5 1/2 year old (9.5 difficulty level). 2. Now devise your plan. Just think about the overall kite construction as a series of OVALS, CIRCLES, TEAR DROPS and HALF CIRCLES. These shapes can then be assembled and then tied together. By keeping this simple guideline in mind, we were able to create a flower, a fish/bug, and a butterfly kite. 3. Take a reed, cut it to size and securely tie ends together by looping quilting thread very tightly around and over a dozen times. Tie a good end knot that cannot easily come undone. Cut wax paper/tissue paper in the same shape as the frame except that it should be 1 inch bigger all around. Cut notches about 1/2 inch apart around the circumference of the wax paper shape. Now you can apply glue stick on the edges and then fold over so as to cover the bamboo frame. We tied an extra reed across the entire flower shape to keep this kite frame stable and straight. This extra support might be necessary for other complex shaped kites as well. As far as the design, layers of shapes and colors can then be glued on the base layer. Here I debated on either a fish or a bug kite and ended up with a BUG FISH. 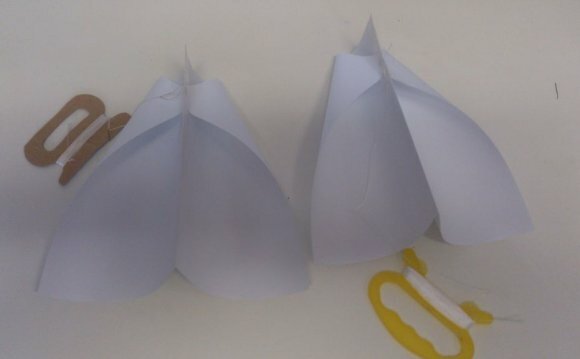 This butterfly kite is the result of layers and layers of tissue paper and wax paper on top of each other. Now you can attach kite string onto the decorated face of the kite. We did this by using a sewing needle and looping it through the paper and the reed, which is underneath the paper. Placement depends on the kite design itself but rule of thumb is to find 2-3 areas to string and then those strings can then be joined together at a point about 12 inches from the kite. Think "pyramid". Then a longer kite string can then be tied to the center point. Truly, this part requires experimentation and is based on the shape of the kite itself. Testing my parafoil kite design on Surfers Paradise.